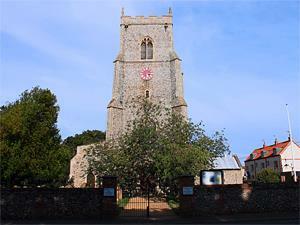 Brancaster01485 532610work VillageThe village with the church of St Mary The Virgin at its centre is surrounded by stunning coastline. It is a popular stopping point for people exploring the Norfolk Coast Path and is close to wonderful nature reserves including the RSPB reserve at Titchwell. To the east of the current village location, there was a Roman fort and settlement named Branodunum. The area was also the location of a Saxon Shore Fort settlement. Although any remains are largely unexcavated the site is now a Scheduled Ancient Monument. At the heart of the village St. Mary's church dates from the 14th and 15th century with typical 14th century arcading and the grandiose 15th century tower. Today the village is famous for its fabulous beach and marshes which are managed by the National Trust. The beach may be used for wind surfing and kite karting within the permitted area. There is a toilet block with good disabled facilities near the car park and a beach shop is open most days during spring, summer and autumn. At the eastern end of the beach there is a Schedule 1 nature reserve clearly marked and fenced to protect nesting ground birds. The village is famous as being the home of the Royal West Norfolk Golf Club, one of the most famous links golf courses in the UK. The village with the church of St Mary The Virgin at its centre is surrounded by stunning coastline. It is a popular stopping point for people exploring the Norfolk Coast Path and is close to wonderful nature reserves including the RSPB reserve at Titchwell. At the heart of the village is the Ship Hotel with bar and restaurant facilities.